The two men were left waiting for help in a remote part of the Indian Ocean. 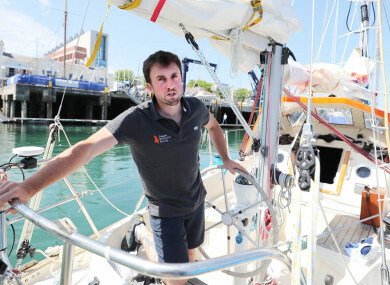 Gregor McGuckin on his yacht in Dun Laoghaire harbour before he sets off on the Golden Globe solo round the world race. TWO SOLO YACHTSMEN stranded in the remote Indian Ocean during a round-the-world race were in a “good and stable condition” after being rescued in a multinational mission. As part of an international effort to reach the men, both sailors were located and brought on board French fisheries patrol vessel FPV Osiris yesterday. “Both sailors at this stage are reported to be good and in a stable condition,” Al Lloyd of coordinating agency the Australian Maritime Safety Authority told reporters in Canberra. Lloyd said the men were due to arrive at a nearby Indian Ocean island Ile Amsterdam later today, where they would be assessed by doctors. McGuckin, 32, was not injured but said he wanted to abandon his yacht after it was damaged. He made his way to Tomy in an attempt to assist him, and arrived at the same time as Osiris, Lloyd said. Email “Irish yachtsman who was marooned in Indian Ocean on way back to Australia”. Feedback on “Irish yachtsman who was marooned in Indian Ocean on way back to Australia”.